You are currently browsing the tag archive for the ‘Fei Fei Dong’ tag. The Youngstown Symphony presented its second Powers Auditorium classical concert on Saturday evening, October 19th with a fine and varied program. The evening’s highlight, an excellent performance of the popular Edvard Grieg Piano Concerto in A Minor, Op. 16, featured the young and remarkably talented Fei-Fei Dong as soloist. Dong, a first-prize winner of the Schumann International Piano competition for Young Musicians, the Asia-Pacific International Chopin Piano Competition, and the Steinway and Sons International Youth Piano Competition, has debuted with orchestras in New York, Paris, Hong Kong, and Aspen, Colorado. 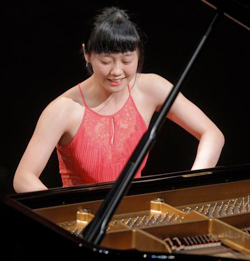 She was also a finalist in the 2013 Van Cliburn Competition. The Cleveland International Piano Competition awarded $116,000 in prizes and another $26,000 in consolation prizes during the final event of the 2011 Competition in Severance Hall on Sunday afternoon, August 7. Five pianists played in the penultimate session of the second round on Monday afternoon. Friday afternoon brought new faces and some fresh repertory to the penultimate session of the first round.